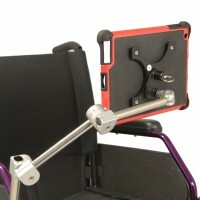 Lite Mounts are specifically designed for small devices up to 2kg such as iPads and switches. The Articulating Lite Mount uses ball joints for positioning and can hold weight up to 1.5kg, or 1.0kg when using the optional handle kit. The Indexing Lite Mount has 'toothed' joints, enabling support for up to 2.0kg in weight. Individual components, including Holder Plates to attach devices to the mounts, can be found in the Components section. LM-DHS: Daessy LiteMount components can be used to create a double head switch mount. This mount ..
LM/K: This kit includes a selection of LiteMount components to let you make up a 2 or 3 length In..